The Farson Blade is an idea that comes from an ancient tool we found in the Great Red Desert near Farson Wyoming. This is a remote area that has an incredible eco system with a unique type of elk, thousands of antelope and various other unique characteristics. The people who lived in this remote area developed crude tools that would cut, chop, slice and skin for the daily needs. We approached this with high quality stainless steel and modern manufacturing methods to come up with a versatile tool that can be used in extreme environments. This blade is a compact, light, versatile tool that can be used to chop kindling, be made into a hatchet, skin process a large animal and even chop up your onions for dinner. It fits in your pack and could save your life. This Limited Edition Carbon Farson Blade ($98.05) model is built from High Carbon Tool Steel and comes with an upgraded Leather Sheath. 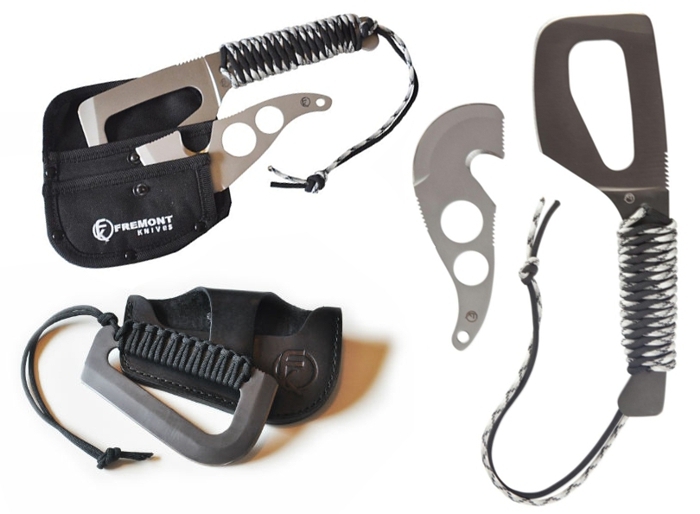 Farson Hunting Combo ($89.95): After playing with our new Farson Hatchet and Hide Glider we realized that we had a complete package of some serious tools to work up your big game. The hatchet is fantastic in breaking bone and the glider skins like a champ. Tools made for easy clean up and designed right for the serious hunter. The overall package is consistent with the other Farson tools in being light weight and easily packed away with minimum space. The Farson Hatchet out performs anything you may have had in your hands lately. Go ahead and choke up on the tool, use it like a knife or firmly grasp the handle and make short work of kindling. Whether you are building a shelter, skinning big game, or simply preparing dinner at camp this unique design gets it done. They say it ain't braggin, if it's true, so put one in your pack and go get it done, what ever it may be for you. Keeping with the same inspiration and tradition, we made the Farson into this great compact hatchet. Light weight, versatile and easily packable, the Farson hatchet may just kick some of the other tools out of your pack. The Hide Glider is another minimal tool that performs maximum work. What could be easier to clean? We just could not tolerate any more small gut hooks and designed this one to do the big jobs with thick hides. The serrations are designed for the index finger to rest when skinning. One of our partners, Jason Wilson, a frustrated, closet knife designer, couldn't help himself in redesigning the skinning knife. Typical gut hooks are way too friggin' small and we really like keeping things simple. This simple design takes advantage of the natural hand position necessary to efficiently skin a big game animal. The only thing it seems to lack is a bottle opener. Fremont Knives was named after Fremont County, Wyoming, where we live the modern western dream. Out here, our values have not really changed all that much, even though the world has. We moved here 6 years ago and found that a lot of our friends are pretty outdoor oriented and love the rugged country and the self sufficient people that live here. Since our background in knives came from working for a large knife company, we decided to start our own enterprise where we design tools for those who have real needs due to the time they spend out of doors. This includes hunters, campers, hikers, and bush craft folks. We listen to them, watch them in the field and then try to come up with affordable tools . The Country of Origin for each product varies. The Farson line is made in China and based on our many years of experience we picked the highest quality suppliers we can find. The Draper Folder is made in the U.S. A good number of our friends in Wyoming live here because of the lifestyle and do not enjoy high salaries, so we aim to make our products very affordable. Sorry if this offends some. We would like to make everything at home too. We reached out to Mike Draper, who has been a custom knife maker for over 10 years in Riverton Wyoming for design help on our folder and the Farson Blade. Mike graciously licensed his designs to us and really understands the kind of folks we are trying to reach with these high performance, quality products.